It doesn’t matter what Alan Annand writes, I’ll read it. Over the years, I’ve come to trust him as an author, and when I saw he had a short story collection out, I downloaded and devoured it. 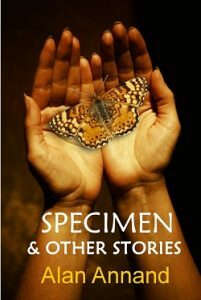 Specimen & Other Stories is a mix of the creepy, the icky, and the hilarious, some of them falling into more than one category. The offerings begin with the humour piece “Bananarama.” This one also falls under icky though with a side-benefit of laughter. You might think you don’t want to read about someone else’s bowel troubles as he struggles to go vegetarian by eating nothing but bananas and drinking only orange juice, but it’s worth it despite the mental images seared into your brain. I laughed out loud until the tears flowed, and I’ve only done that with a Dave Barry offering before. Kudos to Annand for providing what they call the best medicine. “The Date Square Killer,” tells the story of a hit man scoring a date before he goes to work. The creepiness factor heightens as the killer ruminates on life and social justice. The story captured my interest and held it, a typical feature of Annand’s writing. “River Girl” is all wry humour and middle-aged angst. Stanley the cad has a life-changing experience with a free-spirited woman he encounters in Toronto’s Don River. It’s an excellent sample of Annand’s writing and why I always come back for more. “Specimen” brings back the creepiness and dispels the notion that twins can read each other’s minds. Annand plays with twin relationships as he did in Hide in Plain Sight, and the results are just as deadly and just as entertaining. “The Bassman Cometh” takes us back to all-out humour and doesn’t disappoint. I would have enjoyed knowing Annand in university, but perhaps from a distance, as an observer. His description of his escapades with Margaret Atwood again made me laugh out loud. “The Naskapi and the U-Boat,” tells the story of Germans in World War two installing a weather station and finding themselves flummoxed by members of an aboriginal family. It’s the one I found most emotionally engaging as it engendered empathy for the innocent family. While I don’t typically go for short-story collections, I enjoyed this one. Each story was different though unmistakably Annand. Well worth the read, and if you haven’t read anything before by Annand, it’s a good place to start. Toronto author Alan Annand writes crime fiction novels, offering a mix of thriller, mystery, and what he calls New Age noir. He has contributed articles to a variety of astrological magazines. Annand divides his time between his writing, meeting with clients, and giving classes on palmistry and Vedic astrology. He speaks at astrological conferences and New Age gatherings and has appeared on CBC and CTV. He was also a guest on several radio programs. Annand, Alan, Specimen & Other Stories, Toronto: Sextile.com, 2015.